If you like mystery and detective fiction of ANY era, OLD-TIME DETECTION is the perfect choice. Editor Arthur Vidro has done a brilliant job of retrieving “lost” or simply neglected nuggets from the past and bringing them back from undeserved obscurity. This issue covers a lot of ground: detective fiction from the ’20s all the way up to news about the latest reboot of the Poirot series. 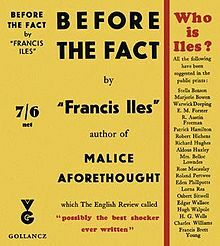 – A look at BEFORE THE FACT.
. . . BEFORE THE FACT is not a traditional crime novel. In this psychological suspense novel told from the point of view of the victim, we follow her life for several years. . . .
– Reviews by Jon L. Breen of books published in 1972, 1976, and 1977. – Charles Shibuk examines two important works about the genre.
. . . I am, however, less than enchanted by Mr. Symons’ casual unmasking of too many villains, and this includes the character who was responsible for the demise of the late Mr. Ackroyd, and his revelation of too many plot devices whose inventors took a great deal of time and effort to keep concealed. . . .
– Critiques of books by Therese Benson, Goodwin Walsh, Neil Gordon, Harry Kemelman, Frank Gruber [THE MIGHTY BLOCKHEAD], and John Dickson Carr [THE BLACK SPECTACLES = THE PROBLEM OF THE GREEN CAPSULE].
. . . Carr so often proclaimed his adherence to the fair-play rule that it is unexpected when he engages in a bit of misdirection that few readers would consider fair. Carr’s plots are puzzling enough without having the additional challenge of trying to discover when to believe the sleuth. . . .
– A quick look at Ngaio Marsh and James Hadley Chase. – William Everson tells us about CRY OF THE CITY. – Reviews by Charles Shibuk that originally appeared a generation ago [including Christie’s PASSENGER TO FRANKFURT and titles by R. L. Goldman and F. J. Whaley].
. . . PATTERN IN BLACK AND RED is an excellent detective novel and a welcome reminder of the Golden Age in America. . . .
– Ellery Queen solves “The Man Who Wanted to Be Murdered,” last published in 1940.
. . . There in the room next to him sat a man who had wagered over a million dollars he would be dead in less than a week, a man who had practically offered four different people a fortune to kill him. And here, pacing up and down the hall outside—waiting—seemingly helpless to prevent whatever crime the old man was bent on, was Ellery Queen. . . .
– In 1946, young Don Yates set out to meet half of the Ellery Queen team.
. . . What followed—his accepting my manuscript and promising to give it a careful reading, his patient signing and inscribing of all my books, the hours he spent lovingly displaying and describing the treasures in his collection—occurred in a magical dimension out of time. When I left, with a handshake and his good wishes for a safe trip home, evening was settling in over Brooklyn. . . .
– A look at THE BEST OF ELLERY QUEEN and a look at TEN DAYS’ WONDER.
. . . Suddenly he sees the motif, the pattern for all the crimes that have been occurring. He counts the crimes. No, not all the crimes, for one crime is missing. Let’s see, which one is it? And then it hits him. The one crime that hasn’t happened, but must happen, is murder. . . .
– Updates in the world of Dame Agatha Christie. – Published three times a year: spring, summer, and autumn. – Sample copy: $6.00 in U.S.; $10.00 anywhere else. – One-year U.S.: $18.00 ($12.50 for Mensans). – One-year overseas: $40.00 (or 20 pounds sterling or 25 euros). – Payment: Checks or cash or U.S. postage stamps. Mike, thanks for this excellent primer on (Gimme That) Old-Time Detection. It is the only print magazine to which I subscribe. I find it a real treasure trove of information on serious, classic mystery fiction, and I am always impressed by the stories Arthur Vidro finds to reprint. The magazine is great fun to read, and your description conveys that.